It’s estimated that more than 890 million smartphones are currently in use in government and commercial environments. While these tools greatly enhance productivity and convenience, they are susceptible to the same voice security vulnerabilities as any other mobile devices – a concern that is particularly relevant given recent reports on the security of the global system for communication (GSM) encryption codes. Though secure voice solutions exist, they have traditionally been expensive, difficult to acquire, cumbersome to operate and easily recognizable. Connected devices, such as un-secure cell phones, are omnipresent in the enterprise and government. While smartphones offer convenience, they are vulnerable to compromise. 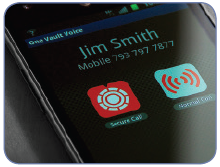 Voice transmission and protection of proprietary information are easier to intercept than ever before. KoolSpan’s TrustCall gives your organization a secure voice solution for smartphones, such as iPhone, Android, Blackberry, and other connected devices. It is easy to use and cost-effective. TrustCall integrates with KoolSpan’s TrustChip, a hardware-anchored microSD encryption engine, to create a fully secure voice encryption solution. Once TrustCall is installed, a user places a secure call by choosing a contact via address book, selecting the “Place Secure Call” option and pressing “send.” TrustCall does the rest. This entire encryption process is seamless for mobile phone and smart device users. Unlike software-only encryption solutions, TrustCall conserves battery life by only being active when secure calls are placed. With TrustCall, your organization has secure voice protection whenever and wherever a sensitive call needs to be placed, from mobile devices or the office landline. TrustCall can be deployed on a client’s network or in a hosted environment. It can be managed from a central platform, TrustCenter®, to activate and terminate secure communications in real-time. TrustCall requires no special equipment for deployment and is easily removed and reinstalled into other compatible connected devices as needed.